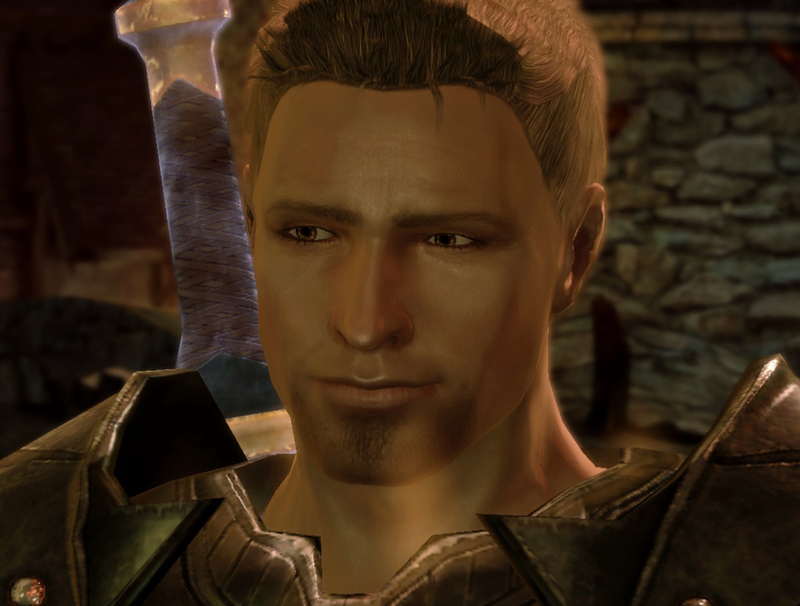 Kaidan, why can't you be more like Alistair? I’m almost finished my second play through of Dragon Age: Origins. I am tempted to play through again to fix some decisions, but since this game doesn’t allow direct replay like Mass Effect does, I really should just content myself with my current headcanon. Headcanon fixes everything. I had hoped to avoid making Mass Effect comparisons in this ‘review,’ but that is impossible. First and foremost, as much as I love Mass Effect and all it stands for, I have to say that DA:O does in a single game what Mass Effect stumbled and ultimately sort of failed to do in three. No, I’m not talking specifically and only about the dreaded endings, however, playing the lovingly labeled “climax” of DA:O made me sad for all the things that ME3 should have had (and did have, but cut) in its ending. DA:O is a solid story of the few against the horde, struggling to gather allies to defeat the Big Bad. Unlike ME3, there are many choices and they do matter in the end. But I won’t dwell. What truly inspired me to play ME was my friends’ talk of the supporting characters and the ability to interact with them. DA:O companions are 10x better. My husband had played it a bit before and I was amused listening to the characters’ comments, so learning from others just how much more colour the DA companions have, I couldn’t help but play and consequently fall in love. As great as the stories are, it’s really the companions that make these games for me and I am not ashamed to admit that I spent a good hour last night trying to deal with my NPC romances, while chatting with Digital Tempest who was busily doing the same in Dragon Age 2. Save the kingdom from the Blight? Yeah in a minute. Lemme just sleep with this cute bard first. "Maker's breath, but you're beautiful"
The other impressive part of this game is the replay value. The game differs enough if you side with different groups and choose different starting options to make it interesting once or twice more. I started as a mage, but wasn’t feeling her. I restarted as a Dalish rogue and instantly fell in love. What really impressed me was that, because Mardelle’s opening storyline differed so greatly from my mage, my views on many elements changed. I went from trying to sleep with Duncan to hating him for taking me away from my people. My only true complaint with this game, is no fault of its own, but of its masters and how they have spoiled me. I played Mass Effect and SWTOR before Dragon Age, which means I spent hours upon hours with voiced characters. As fun as it is to speak on behalf of Mardelle and Allaré, there is something to be said about having voice actors in the lead roles. Combined with the ability to create the character to look as you wish, the voice acting, when done well, really brings the characters to life and makes them feel, perhaps ironically, like my own. And so, as I complete Dragon Age: Origins and start up Dragon Age 2 and download The Silent Grove and read all the books and watch for news of Dragon Age 3 and find all the fan art and write my headcanons, I come to terms with the fact that I have yet another new obsession. Oh Bioware. The things you do to me.